Before saying cheese, ask yourself am I feeling sweet or savory? There are a few things to consider when putting together a cheese board. Here are some guidelines on achieving an appetizing board whatever your preference. On taste, first decide between savory and sweet. A savory plate such as an Antipasto will include meats like Salami or Prosciutto. You can enhance the flavor profile further by choosing flavored meat as opposed to regular cuts. Olives, roasted vegetables, oil, crusty bread or sliced baguette may also accompany a savory board. Similarly, adding herbs and spices like pepper flakes, basil or oregano to olive oil will give more to savor. A sweet board on the other hand, incorporates fruits – both fresh and dried, as well as nuts, jams and, or jellies. Here, crackers, not bread is ideal. In terms of texture, cheese range from soft to hard. Soft cheeses include Brie, Mascarpone, Cottage and Ricotta. Semisoft include Provolone, Fontina, Mozzarella, Blue and Feta. Cheddar and Gouda constitutes hard cheeses; and Parmesan and Asiago some of the hardest on the block. When assembling your cheese board, use a variety of textures. 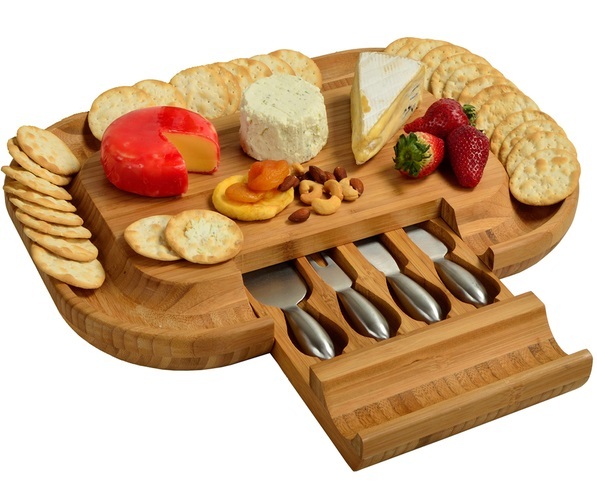 For a normal size board or party, three cheeses will do. Use four or even five for larger gatherings. Other than cheese, nuts can add an extra bite to a dessert board. Almonds and walnuts offer up a nice crunch and an additional layer of flavor. Complete your board with dried fruits like apricots, cherries, cranberry and raisins to round out a dessert cheese plate. While dried fruits have their place on a sweet plate, cheese and fresh fruit alone can be enough. Grapes, strawberries, raspberries, blackberries and figs can sweeten the deal here. Fruits not only add layers of flavor but a range of vibrant color that stand in contrast to the more subtle hues of cheese. As previously mentioned, fruity spreads like jams, jellies and even honey, makes for a luscious finish. More than just taste and texture, you can create a themed board with cheeses from a particular region. For example, an Italian inspired board might have Gorgonzola and Mascarpone cheeses, while a French plate might include Brie, Goat, and Camembert. To go all out with your theme, serve wine from each region. For a really large party, opt for two boards; one savory and one sweet. Your guests will thank you before you can say cheese! Whether soft, hard, sweet or savory, having it your whey with a cheese board can be a delectable start or sweet end to a party. What is your go to snack cheese? Whey in here and I’ll respond to your comments. Looking for a succulent side dish to serve on that summer plate? These Grilled Baby Bella Mushrooms in Garlic Butter make the perfect addition. They’re earthy, flavorful, from the grill and pairs nicely with that fillet of fresh fish! On the stovetop, heat 10” skillet at medium temperature. Add butter, shaved garlic and sauté for about 4 minutes. Meanwhile, wipe mushrooms with slightly damp paper towel, snip stems and cut into ¼ inch slices. Heat grill at high temperature. Brush grates with vegetable oil. Grill mushroom s for about 90 seconds on each side. Remove sautéed garlic from stovetop. Add sea salt and grilled mushrooms and toss. Serve as a flavorful side dish. Baby Bella mushrooms are a type of brown mushroom. They are young, not fully matured Portobello mushrooms. 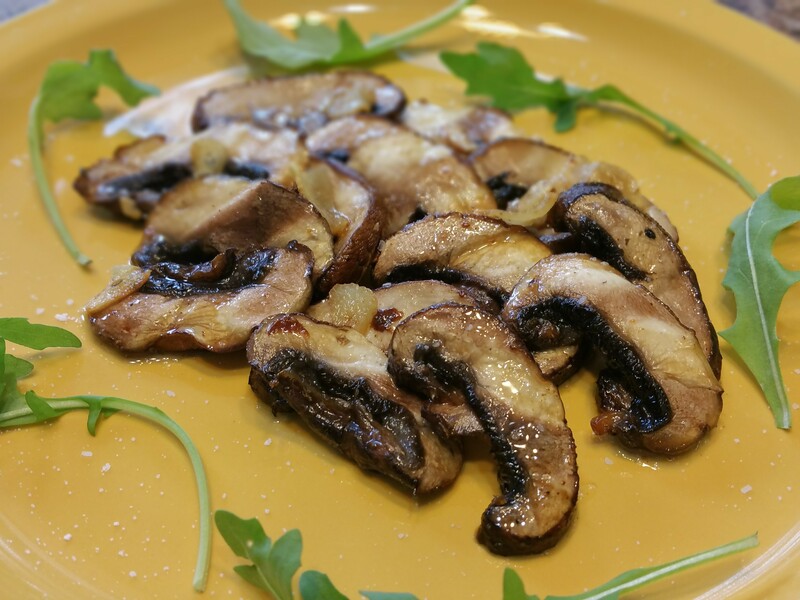 Also known as Cremini mushrooms they are low in calories and a good source of antioxidants and other nutrients. Note: Tableware provided by Libbey Foodservice. It’s that time of year when the weather begins to warm, local farmers’ market are getting ready for their season opening, and the seeds you started indoors weeks ago have sprouted. Today, however, I’m dishing out more than just your garden variety veggies. 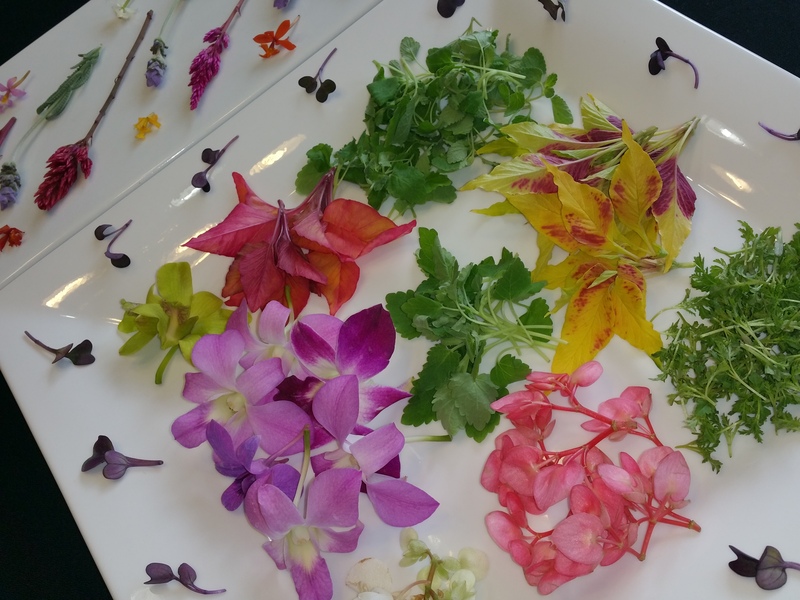 We’re going gourmet with edible botanicals – leaves, flowers, herbs, plants, and plant mixes that do more than just pretty up the plate. Since we eat with our eyes long before we take a bite, we appreciate the role garnish plays on a plate. Think color, freshness and overall presentation. But, why pick useless shrub when the right trim can work wonders? Edible botanicals – leaves, flowers, greens, herbs, and plants add vibrancy, flare, flavor and function. Dressing up a dish with an orchid – neutral in taste and lavender or purple in color, adds snap without sacrificing flavor. A begonia mix boasts a zesty, crisp, tart finish – the perfect blend for a delightful citrus salad. Or spread it around a savory seafood platter in place of lime or lemon. The pretty pink petals of begonias (comes in white too) with bright yellow centers adds just the right amount of radiance for spring and summer entertaining. The appropriate finish can also take fare from palatable to perfection. For example, a mint mix will enhance the flavor of lamb, while it’s small, delicate, bright green leaves create a stark contrast to the seared, crusted exterior of the meat. 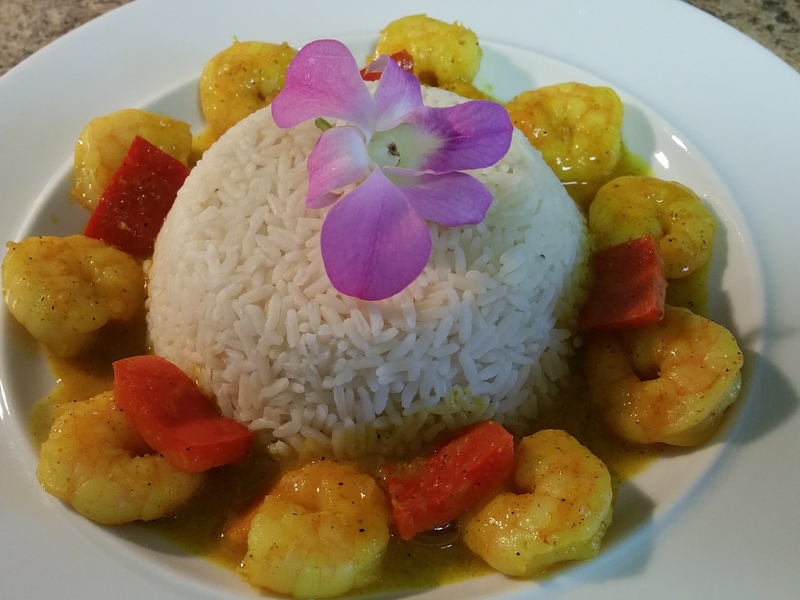 I’m an island girl so whenever possible or as appropriate I mix in as much of the Caribbean into my culinary creations as I can get away with. And with edible botanicals I get away with quite a bit! Shoot, it’s literally a field of dreams. And the spring and summer seasons my playground – with plenty of plants to play with on my plate. The bounty of veggies and flowers found in the Caribbean are endless. Hibiscus, sorrel, cilantro, onion, turnip, thyme, mint, rosemary, orchid… Did you know Jamaica has over 200 species of orchid? Not to mention herbs. You know Jamaica has herb! Now that you’re familiar with what’s on the market, here’s how to ensure you get the most use of your petite produce. Keep fresh by refrigerating immediately. Suppliers generally guarantee freshness for up to a week. However, I find that by keeping them in their original packaging, sealing in an airtight zipper bag then storing in the refrigerator you can squeeze out an extra 2 or more days. Whatever your taste, go for plating that’s more than pretty. Elevate the experience by choosing the right green and go from garnish to gourmet! Note: Samples for the attached photo provided by Gourmet Sweet Botanicals.